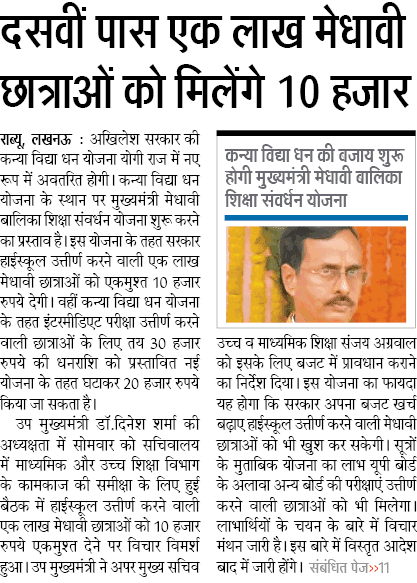 UP 1 Lakh High School Pass Girl Scheme 2018-19 2019-20 will Replace Kanya Vidyadhan Yojana to UP Meghavi Balika Shiksha Samvardhan Yojana total 1 Lakh girls selected and in 1 installment UP Government will give Rupees 10,000. However in Samajwadi Party Government Rs 30,000 scheme named Kanya Vidyadhan Yojana, new government deducted Rs 10,000 and passed new budget to implement Meghavi Balika Shiksha Samvardhan Scheme. UP Sub Chief Minister Dinesha Sharma said they want to happy high passed girls these years. 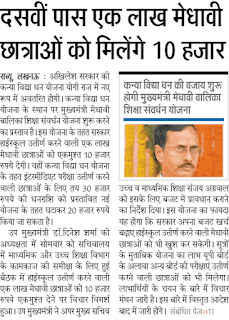 Further Said UP Balika 10,000 Yojana is also for CBSE ICSE and Other Board which are running in UP. 30,000 given in Kanya Vidyadhan Yojana for First Class Intermediate Pass Students and Now Rs 20,000. UP Meghavi Balika Shiksha Samvardhan who will get scholarship: 75% of the total goes to girls to UP Board. Educational Qualification for UP MBSSY Yojana: Girl Students Should has First Class passed from UP Board, CBSE. Other UPMS, ICSE Board, Madras Board, and Sanskrit Board are eligible. Age Limit: Anyone can apply who recently passed in year 2017. Eligibility Criteria: Should have to show Income Certificate (we will update soon family income). But Girls belong to BPL Category will be given priority. Meghavi Balika Shiksha Samvardhan Yojana List: we soon update the Benefit List. How to Apply for UP MBSSY Online Registration 2017 Application Form: Interested and Eligible Girls may visit the official website for Latest Uttar Pradesh Scheme i.e. madhyamikshiksha.up.nic.in. In next stage Download the School name and list who get under new scheme form.